Don’t Worry Run Halfsy! Race weekend is finally here, and we have compiled 10 tips for taking on race weekend like a pro! 1. 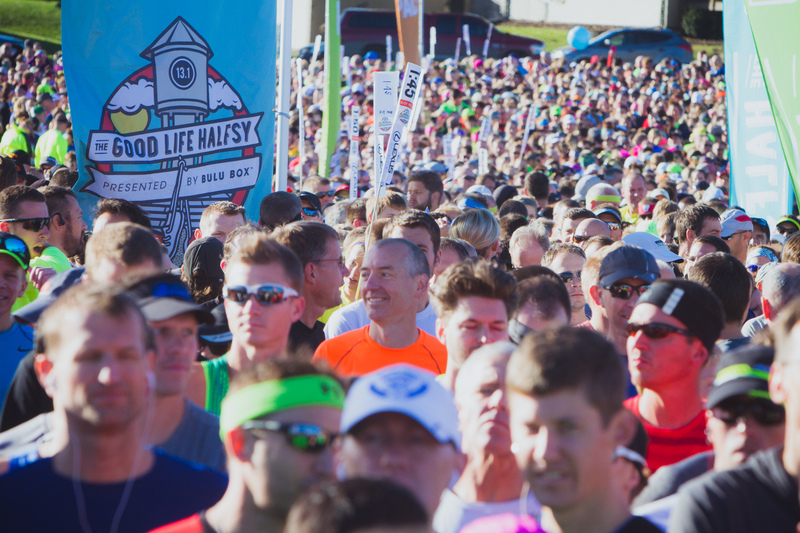 Pickup Your Packet Early | Join us for the Good Life Halfsy – Excel Chiropractic & Wellness Expo on Saturday from 12 – 6 and avoid the stress of lines on race morning. Read more about the Expo, parking downtown, packet proxy & our schedule here>>. 2. Dress for Success | On race day, be sure to dress for success! Layers are great, but be sure to take advantage of our gear check system to avoid over heating on the race course or running with your favorite jacket around your waist for 12 miles. “Runners want to dress as they would at 20 degrees warmer than the air temperature on race morning,” said Ann Ringlein of Lincoln Running Company. “If it’s going to be 50 degrees at the start of the race, pretend it’s 70 degrees! After only a mile or two your body temp will rise quickly and too many layers or heavy clothing could cause runners to overheat.” Learn more about race bag check on page 17 of your race guide. 3. Arrive in Style | Parking is plentiful but not unlimited, so we encourage you to car-pool or better yet, be dropped off on the EAST side of Seacrest field. Don’t forget ALL runners are welcome to take advantage of our post race shuttle from the Railyard back to Seacrest. Find parking details on page 16 of the race guide. Shuttle details are on page 21. 4. Have a Support Crew Plan | From where to cheer for you along the course, to how to find you at the finish line. Have a plan for your support crew! Check out our Spectator Guide for full details. They can also sign up to track you with race updates here>>. 5. Join a Lexus of Lincoln Pace Group | We’ve assembled quite possibly the most enthusiastic pace team possible thanks to Lexus of Lincoln! Ask pacers questions at the “Pace Team Booth” at the Run Expo and be sure to grab a Pace Band for your goal race pace. We will have pacers for the following times: 1:35, 1:40, 1:45, 1:50, 1:55, 2:00, 2:05, 2:10, 2:15, 2:20, 2:25, 2:30, 2:35, 2:40, 2:45 and 2:50. 6. Get Inspired by Our Halfsy Hero Stories | Read the stories of our Halfsy Heroes training process up to race day. From an mom who happens to be an elite-runner, to a first timer Half Marathoner. Get inspired here>>. 7. Know Your Bib # | Make the packet pickup process as easy as possible; Know your bib #! 8. #LNK | Plan a great weekend in LNK, whether it’s taking advantage of our runner wristband offers (pg 8) from local merchants, or hitting one of these hot spots around town! 9. Enjoy the Finish Festivities | Stop by the photo booths on Canopy St, drop in the Lincoln Station for a free post race massage or ART Treatment, grab your free post race beer in the Railyard, pickup your official Halfsy Merch from our store! Check out the finish line map here>>.